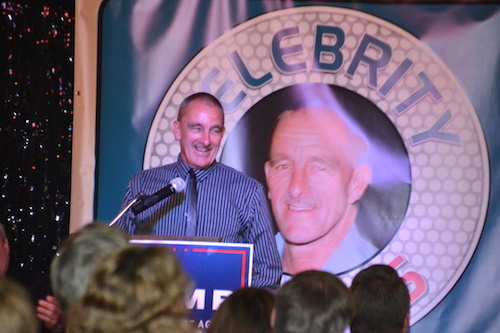 GAINES – Jim Babcock was roasted on Saturday during a benefit at Tillman’s Village Inn. 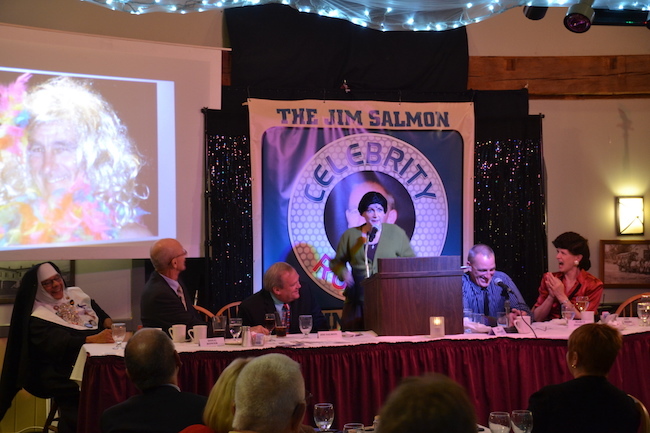 About 100 people attended the event, which was a fund-raiser for The Salmon Children’s Foundation. That foundation has raised about $15,000 for Albion High School graduates in scholarships in memory of Nicholas Kovaleski. 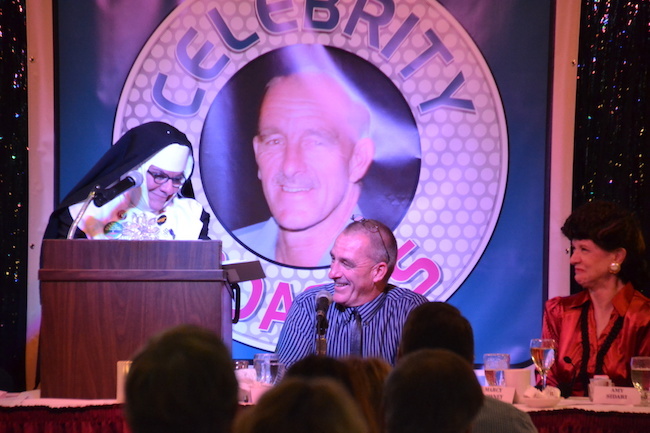 This photo shows Phyl Contestable, “The Reverend Mother,” picking on Babcock, a local contractor and owner of Jim Babcock Construction. The Reverend Mother said Babcock was a handful for the nuns when he attended Catholic school in Albion. 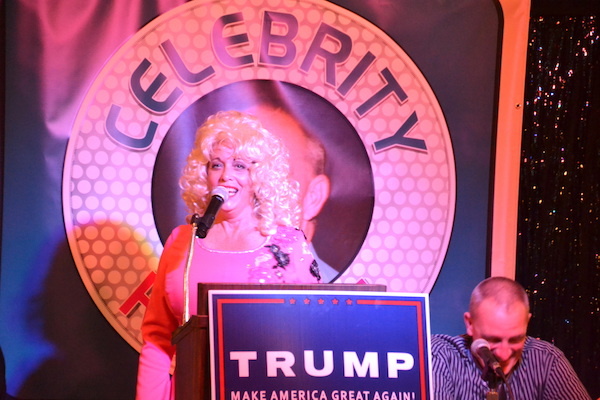 Marcy Downey plays Ernestine, a telephone operator, during the roast of Babcock. Downey pretended to get a call from a motorist who discovered Babcock, who battles narcolepsy, asleep in his truck by the side of the road. Jim Salmon is at left. He served as host of the roast. Steve Babcock shared some silly childhood stories of his brother to the delight of the crowd. 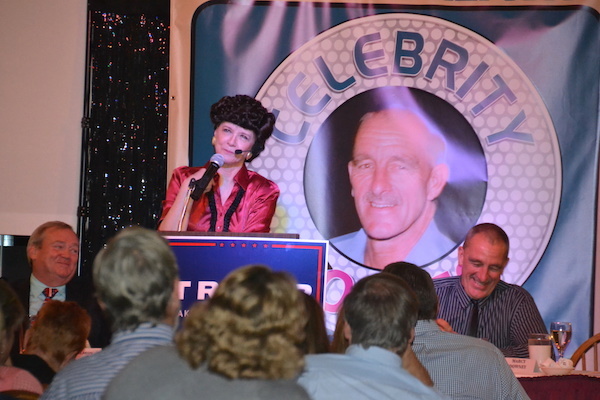 Amy Sidari took a turn roasting Babcock and showed a photo of Babcock dressed as a woman during a fund-raiser at the Cabaret at Studio B. Babcock has also portrayed Sony Bono in a variety show at the Cabaret. Josie Waverly is dressed as Dolly Parton. Waverly performed a spoof of the Parton song, “9 to 5,” in describing a kitchen repair gone wrong. 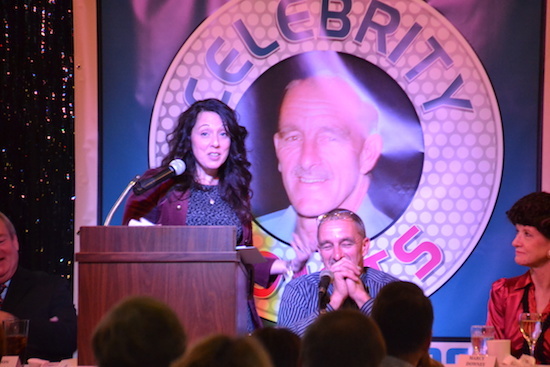 Kelly Kovaleski, mother of the late Nicholas Kovaleski, said her son had a good sense of humor and would have enjoyed the roast of Babcock. The Kovaleski family has launched the “Live With Purpose” organization to help high schoolers set goals, make positive choices and utilize their talents. Kelly and her husband Jay will debut their interactive workshop for the community at Holy Family Parish on Oct. 26 from 7 to 8 p.m. Click here for more information. Nicholas Kovaleski was remarkably determined, even as a teenager, working towards his goals in football, swimming and tennis, and giving of himself by helping at home and through Boy Scouts. Nicholas adopted “Live with Purpose” as his motto when he was 11. He was courageous in his fight against leukemia. Nicholas was just 15 when he died from the disease on June 29, 2011. 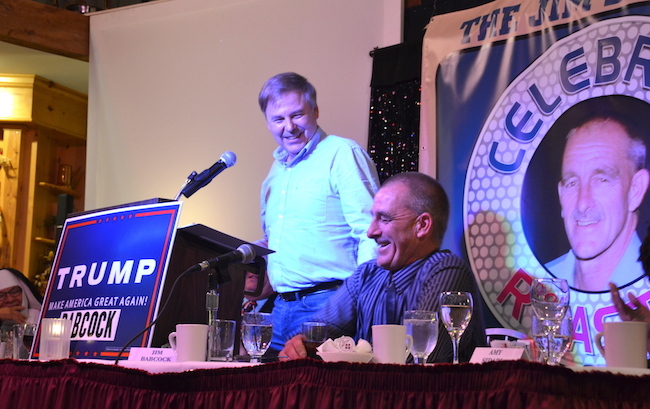 Babcock thanked the crowd and participants for the roast on Saturday.